An East Naples landlord accused of killing a tenant who owed him rent was released from the Naples Jail Center Wednesday night, two days after the fatal shooting. 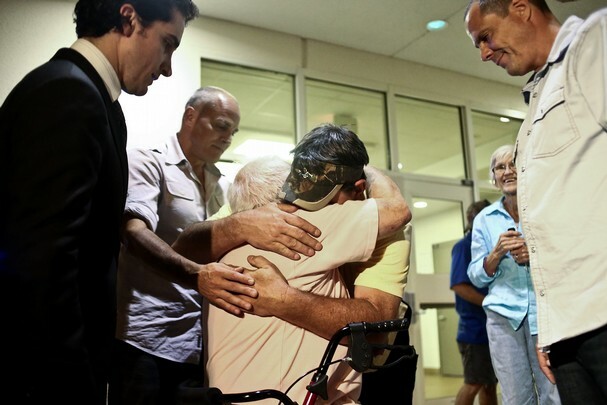 An overwhelmed and silent Javier Ortoll, 78, was greeted by family members who had waited at the jail for him for more than an hour. They clapped the moment the metal jail door slid open and they saw Ortoll amble toward them with help from his wheeled walker. Ortoll wore the new clothes they had brought him — a pink shirt, dark-colored shorts and his house slippers. The clothing he wore when he was brought into the jail is now evidence in the murder investigation. Ortoll, of the 3500 block of Okeechobee Street, faces a charge of second-degree murder in the Monday morning shooting death of Edward Melone, 51. A witness told Collier County sheriff’s investigators that Ortoll pulled his white van in front of Melone’s home on Okeechobee Street and yelled at Melone about unpaid rent. The witness said that at some point Melone leaned into the van to retrieve a fallen cell phone, and Ortoll shot him in the chest, according the arrest report. “He shot me,” Melone said to a witness, as he began walking toward the house, according to an incident report released Wednesday. Ortoll’s family members and attorneys said Ortoll, who has trouble moving on his own because of his health, felt threatened and fired the shot to protect himself. His statements to investigators were redacted from the incident report. James Zonas, one of Ortoll’s Naples-based attorneys, said he might use Florida’s “stand your ground” law to defend Ortoll in court. At a bond hearing Wednesday afternoon, Zonas argued Ortoll is not a flight risk partly because of significant health issues. Judge Michael J. Provost set Ortoll’s bond at $75,000. State prosecutors had asked Provost to set a $250,000 bond. Any remaining fire arms Ortoll owns were ordered to be removed from his possession. Three were already recovered from Ortoll’s van the day of the shooting, according to the Collier County Sheriff’s Office arrest report. Additionally, Provost agreed with the state’s request for a no-contact order between Ortoll and Melone’s family, who still live in the Okeechobee Street rental home, which is across the street from Ortoll’s own residence. Provost said someone else would have to make contact with the tenants to pick up any rent. Zonas said he does not anticipate any trouble. “I think the rent issue is not going to be addressed any further,” he said. “It’s unfair (Ortoll) was even arrested,” Lamm said. Jason Schwartz, Zonas’ law partner, declined to comment about the website. After exiting the Naples Jail Center building Wednesday night, Ortoll sat down on his walker seat. One of his sons wheeled him quickly to a waiting car. It took three men to help him into the front seat.